Tues. July 1st 6p.m. Melanie Carey will be hosting a party @ her home in Lehi. (2226 N. 1960 W.) She Has invited the girls from Shoe Fetish as well. This will be the perfect time to shop for those summertime "must haves". We hope to see you there. Remember that you will get one FREE flower when you bring a uninvited, purchasing friend! 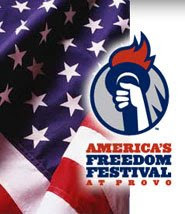 We are also very excited to be a party of the Provo City Freedom Festival this week. We will be there with our friends from Sneak A' Roos, Thurs. July 3rd noon-10 p.m., Fri. July 4th 8a.m.-10p.m. & Sat. July 5th 10a.m. - 8p.m. Have a wonderful week and a safe, happy 4th... wherever you may be! Enjoy!